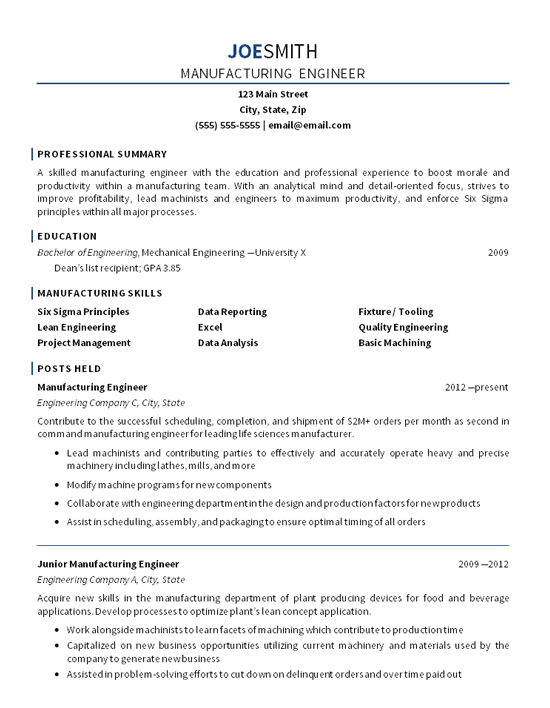 The manufacturing engineer resume example highlights skills for an extremely qualified professional with the experience and knowledge they have gained from the workplace. These qualifications have contributed to contribute in an operations environment as a leading engineer who facilitates improvements. The goal of this resume was for a lateral move to another company where more opportunity for growth existed. The candidate was looking to gain a few more years’ experience in a different sector of manufacturing to expand their knowledge across multiple industries. Contribute to the successful scheduling, completion, and shipment of $2M+ orders per month as second in command manufacturing engineer for leading life sciences manufacturer. Lead machinists and contributing parties to effectively and accurately operate heavy and precise machinery including lathes, mills, and more. Modify machine programs for new components. Collaborate with engineering department in the design and production factors for new products. Assist in scheduling, assembly, and packaging to ensure optimal timing of all orders. Acquire new skills in the manufacturing department of plant producing devices for food and beverage applications. Develop processes to optimize plant’s lean concept application. Work alongside machinists to learn facets of machining which contribute to production time. Capitalize on new business opportunities utilizing current machinery and materials used by the company to generate new business. Assist in problem-solving efforts to cut down on delinquent orders and over time paid out.